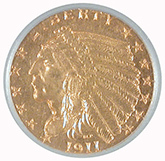 This is the key date $2 1/2 Indian in a very desirable MS-62 grade. Coin displays good luster, strike and super clean surfaces. Gold, silver and platinum bullion are back on the rise after being down slightly in the last 2 months. The continuing stream of bad economic news, a weak dollar, 9% unemployment, the european debt crisis and a potential Iranian crisis has pushed demand for metals over the top. Retail demand for gold, silver and especially platinum are up once again up at strong levels. Premiums over spot on bullion are still above average. Generic gold coins in circulated to low mint state grades are climbing again with the rise in metals prices. Demand for truly rare coins is still strong. There is almost no availability of quality rare coins of low population, especially in the area of gold. More.. Welcome to our web store! we continue to add new content, check out our featured articles and continuously updated coin and bullion news. We also feature current PCGS price guide and Numismedia pricing information as well as high quality photos and coin magnifier tool. Get the latest rare coin market news, discounts and first shot at our new purchases! Sign up today for our email list! Click here to send us your list of coins for sale. We buy all old coins and coin collections, platinum, silver, gold bullion and scrap gold jewelry. Click here to view this week's specials. New to investing in gold? Read our in depth guide to buying and selling gold coins and bars. More..